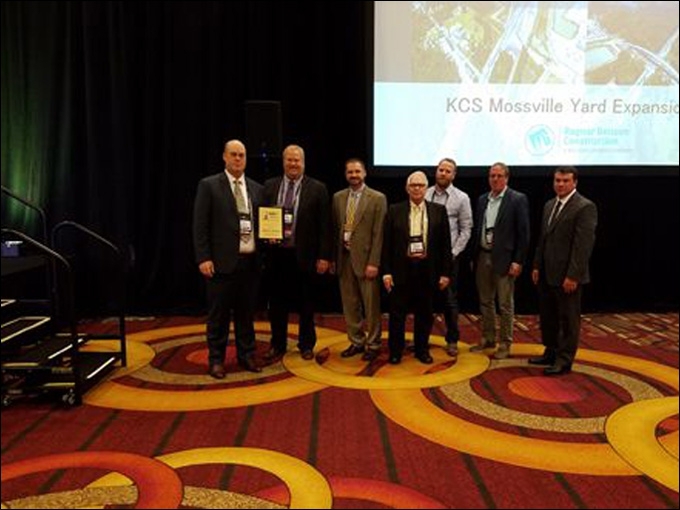 The Kansas City Southern (KCS) Mossville Yard Expansion Project in Westlake, La., by Ragnar Benson, LLC, received the 2017 award for Large Project of the Year. Union Pacific’s (UP) Lakeside Sub Bridge Project in Box Elder County, Utah, by Ames Construction (Ames) was chosen as the NRC 2017 Small Project of the Year. NRC named Phil Hutton, track manager for Universal Rail Systems (URS), as the 2017 Field Employee of the Year. The KCS project had two major components. The first was a classification yard to expand the railroad’s operations. The second was a rehabilitated and expanded leased storage yard to enable the construction of the nearby Sasol Ethane Cracker Plant. The 200-acre project included 212,769 feet of new track and 37,843 feet of rehabilitated track, drainage, lighting and roadways, NRC said. The existing KCS yard facilities were demolished and four new buildings were added, officials said. A wastewater treatment system, a fuel unloading track and a spill containment area were also implemented. Crews constructed a new 13-span bridge across the old yard to allow traffic to travel over the new yard without the need for multiple crossings. The KCS project brought on many challenges, such as relocating a water canal, gas line, and a 115 KVA power line, and establishing drainage in swampy conditions. Ragnar Benson continually reworked the project schedule to maximize available work as unexpected challenges arose. There were 405,000 man-hours worked put into the project, NRC said. The Ragnar Benson team had zero recordable injuries and no lost time accidents. Named as the 2017 Small Project of the Year, the UP Lakeside Sub Bridge Project allowed for UP’s 24-mile causeway across the Great Salt Lake outside of Ogden, Utah. NRC said it is a vital link in the transcontinental railroad, carrying dozens of trains daily. Built in 1900, undergoing a partial reconstruction in the 1950s, the passage of time and its location in a harsh physical environment compromised the two concrete culverts that had allowed water to flow through the causeway. By 2011, the causeway had sunk more than 15 feet, which NRC said rendered the culverts ineffective. Ames was the prime contractor for construction of a 180-foot six-span precast box girder bridge to reestablish the bi-directional water flow between the two arms of the lake. Ames faced multiple challenges, including limited site access, track time and staging areas, as well as environmental permit restrictions. An existing low-capacity bridge on the causeway complicated mobilization of heavy equipment to the bridge site. Equipment had to be delivered on highway-rated transport trucks and assembled at the construction site, which had extremely limited work areas alongside active tracks with high train traffic. More than 40,000 man-hours were put into the project with one recordable injury. There was no lost time or restricted days. Hutton, named 2017 Field Employee of the Year, was previously employed by Canadian National Railway. He joined URS in 2012 as a Track Protection Rule 42 Foreman and was often responsible for protecting complex projects. In less than two years, Hutton was promoted to assistant track protection manager and, in 2014, he became the track protection manager with responsibility for more than 50 flagmen covering an operating area of nearly 7,000 square miles, NRC notes. Hutton’s knowledge of the industry, commitment to customers, leadership abilities and his dedication to safety are among the many attributes that make for an outstanding Field Employee of the Year, NRC said.